Microsoft's October event in New York wrapped up a few hours ago. The company showed off a new line of Surface devices including updates to the current core offerings plus a new product, Surface Headphones. Microsoft's upgrades in the Surface Pro 6 make this the fastest Surface Pro ever. Thanks to the use of the latest 8th generation Intel Quad Core (i5 or i7) processor it can perform up to 67 per cent faster that the 5th generation Surface, wrote Microsoft's Chief Product Office, Panos Panay, on the Windows blog. The new Surface Pro 6 features a 12.3-inch Microsoft PixelSense Touch Display, 8GB or 16GB RAM, 128GB, 256GB, 512GB, or 1TB SSD options, Intel UHD Graphics 620, all day battery life (13.5 hours local video playback), 8MP autofocus rear camera and 5MP front facing camera + Windows Hello login, 1.6W stereo speakers with Dolby Audio Premium, full friction hinged kickstand and the following ports - 1 x full-size USB 3.0, 3.5 mm headphone jack, Mini DisplayPort, 1 x Surface Connect port, Surface Type Cover port, MicroSDXC card reader. It measures 292 mm x 201 mm x 8.5 mm and weighs 780g without the optional type cover. The new Surface Pro 6 is available starting from $899 from 16th October. Potentially big news for some: the device is now available in a matte black finish. Again the headline change is that Microsoft has updated the processor behind this Surface. 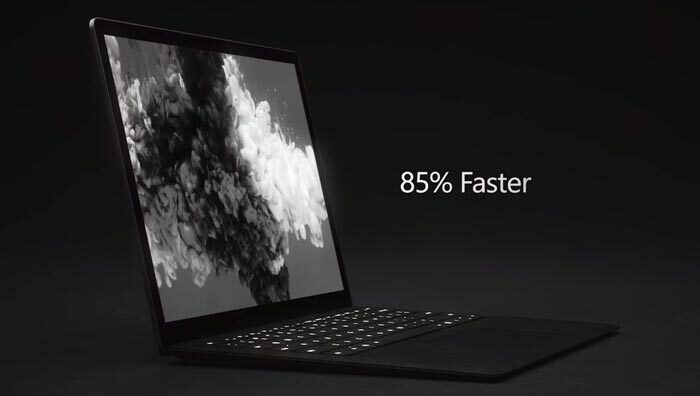 A new Quad Core 8th generation Intel processor features to make this portable "an astounding 85 percent faster than the original Surface Laptop," according to Panos Panay. The Surface Laptop 2 comes in four colours, platinum, burgundy, cobalt blue, and the same matt black as the Surface Pro 6. The experience provided by its construction, 13.5-inch PixelSense touch display, and "best in class keyboard and trackpad," is said to be premium, and it can keep going for up to 14.5 hours on a single charge. The tech specs on offer are very similar to those of the Surface Pro 6 except this device doesn't have a rear camera. Carrying around the Surface Laptop 2 shouldn't be too much of a burden as it measures 308.1 mm x 223.27 mm x 14.48 mm and weighs in at 1.25kg. You can configure Surface Laptop 2 machines starting from $999. Again, shipments will start from 16th October. Microsoft's "most powerful Surface yet" comes with an Intel Core i7-7820HQ processor, bumped up Nvidia GPU with more graphics memory, and SSD file storage. 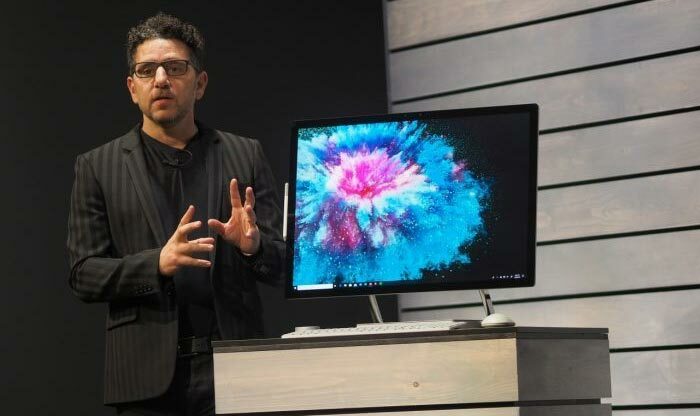 In particular Panos Panay boasts that the new 28-inch Microsoft Surface 2 AiO comes with a 50 per cent faster "next generation Pascal" GPU. With an AiO it is important to have an excellent screen equipped as the whole machine is based around this. Microsoft says it has improved the PixelSense screen and this 28-inch 4500 x 3000 pixel touch display is now 38 per cent brighter, with 22 per cent more contrast. Users can add up to 2x 4K (30Hz) or 1x 4K (60Hz) external displays. The screen is compatible with Surface Dial on-screen interaction. Key tech specs beyond the processor and screen specified above are the; Nvidia GeForce GTX 1060 6GB or GTX 1070 8GB GPUs, 16 or 32GB of DDR4 RAM, 1 or 2TB SSD, and ports including - 4 x USB 3.0 (one high power port), Full-size SD card reader (SDXC) compatible, 1 x USB-C, 3.5 mm headphone jack, 1 x Gigabit Ethernet port, 802.11ac Wi-Fi, BT 4.0, Xbox Wireless. There is a Windows hello front facing camera plus dual microphones and 2.1 Dolby Audio Premium speaker system. Those interested can pre-order a Surface Studio 2 from $3499 for shipping by 15th November. Microsoft said it decided to build the Surface Headphones to provide a complete Surface experience. They are designed to provide "a smarter way to listen, with spectacular rich audio and hands-free calling". Microsoft has used its dial concept in this design and one ear cup (right) dial turns to adjust volume, while another turns to adjust (13) noise cancellation levels. Smartly the headphones auto-pause/resume media when you take them off/put them on. There are hardware power and mute buttons too. Inside the headphones are 40mm main drivers and 2 beam-forming microphones on each ear cup, 8 microphones in total. The microphones are handy for use in apps like Skype, or for querying Cortana. A single charge of less than 2 hours can power these headphones for 15 hours. Microsoft supplies a 1.2m audio cable (3.5mm connector), and a 1.5m USB-C cable (for charging and/or wired connection). This headset weighs 290g. Microsoft's Surface Headphones are available to pre-order depending upon your location, for $349. No shipping date has been provided. The 7th Gen i7 in the Surface Studio seems like a daft choice - that makes the whole thing less powerful than a 15 inch laptop! I am kind of relieved that they didn't do more than an incremental refresh of the SP line. My Surface Pro is only 11 months old and i'd have been a little gutted if they had made some stellar improvements - but as it is I will happily keep mine and wait until next year's refresh which will hopefully finally see USB-C support. They do look pretty in black though :) Hopefully harder wearing than the SP2's black finish which scratched far too easily. Yeah given they have USB-C on the Go I would of expected the new Pro to have it as well..